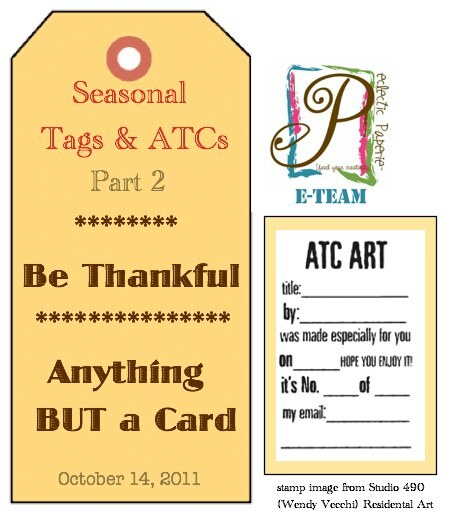 The E-Team accepted their second challenge for our Seasonal Tags, ATCs & More series. 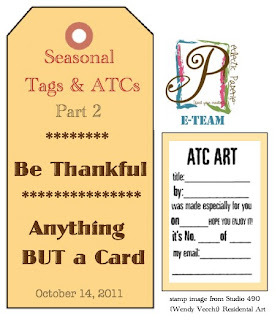 They were asked to use a tag or ATCs, but use it on anything but a card. I think you'll be excited to see that they really ran with this challenge and made anything but a card. Not sure if any tags were even included but you'll see some beautiful and heartfelt 3D projects while you visit each E-Team member. You have from today until Sunday, Oct 16th to leave a comment. We'll randomly choose 3 winners total to a $20 Gift Voucher to shop at eclectic Paperie. Leave a comment on this blog for a chance to win an eclectic Paperie box of goodies including some papers, stamps, ribbons and more surprises. Tell me what the word GRATITUDE means to you. 2 winners will be chosen from this eP blog to win a box full of eP goodies. Winners will be announced on this eP blog late Monday, Oct 17th. Gratitude to me is giving thanks for something someone else does or gives to you. I am grateful to you for your inspiration and the joy it brings to me each day! What a great blog hop, Daisy! I really look forward to each and every one. And gratitude? It's the attitude that takes the time to acknowledge all the wonderful things that fill each and every day. As always, the team has done some wonderful projects. To me, gratitude is being content and thankful for all the blessings I've been given. To me graditude is being grateful for all that has been given to me, to appreciate all I have and to be able to share with others. I get such great inspiration from these blogs. Keep up the good work. You have my gratitude! Gratitude is being thankful for all the many blessings in my life and the realization that they are so plentiful. Thanks for the opportunity to reflect on those many blessings and remind me to let some of my family and friends know they are such an important part of my life. Gratitude today is having my grandson home after 2 months in the NICU. We are grateful for the loving care he received after being born 3 months early. with me,and now stamps and creates with me! Gratitude is being thankful for what you have, not being angry that you don't have all you want. it is counting all the good in your life, not the bad. it is choosing to look on the bright side even in the dark. it is the grace that enables us to live. it is for the big and the small things that make us happy and content. it is for giving praise and honor to those who provide these things. i am grateful to you for your shop, providing inspiration, giving acess to wonderful blogs . Daisy, what an amazing blog hop your DT has created! All the ideas are just superb and I've got lots of inspiration from each project. Gratitude is seeing a smile, knowing that you've brightened their day in some way. Gratitude to me is being thankful for all that my parents gave to me in ways that can never be measured. A husband that is always by my side and children and grandchildren that are healthy! Friends that can always lift my spirits during those bad times! I give gratitude for all in my life, but mostly the people and pets that have blessed me! There were some wonderful projects on this Blog Hop. Gratitude to me means being thankful for all the many blessing God has given me, especially for a wonderful, support husband and loving son. Wonderful blog hop! So many talented designers and inspiring creations! To me gratitude is feeling blessed! I thank the Lord Jesus for all the blessings in my life. For me gratitude means being happy with what you have. Each of us is lucky in our own way! Thanks to everyone for another fabulous hop!! Gratitude...a way to show thankfulness for a kindness extended to another. A hug, a warm smile or a simple 'thank you'. My gratitude goes out to you and the entire team for the hours I spend here daily just enjoying all that you do to create and inspire! Thank you! Gratitude is being thankful for all the blessings and things in our lives. Thank you for the great blog hop! The team is awesome! Great blog hop! Gratitude is what I am very full of lately! My daughter was in an accident the first week of August and was injured, but while checking on her injuries, they found issues and were pretty sure she had lung cancer! I am so thankful that it was NOT cancer. Sarcoidosis, but we will deal with it as it comes and goes. Also thankful that the offer they made on a home was accepted as it is down the block from me and the grandkids will be able to walk to see us now, if we ever get it finished up. Hopefully the painting will be done this week-end, then the floors and electrical early next week. Furniture comes next week. What a great idea for a hop. Cannot wait to see what all these crafty ladies come up with. as always, you put on a great show. gratitude is being humbled by a me-me-me society. Gratitude is being thankful & content with all the blessings & goodness in my life. Thanks & gratitude to you for a fab blog hop! Great hop with amazing projects! As for gratitude- it's being thankful for something or someone and stating that thankfulness in some appropriate manner. Gratitude means being happy to be, exist, live. This includes all of the good and the bad. Breathing in, breathing out, eating, sleeping, aging, thinking, burping, creating and all of the other processes are what I am thankful for. When I hear the word "gratitude", I think of all the many people and things I have to be grateful for. Gratitude means appreciating and being grateful for friends and family who lend a hand or a prayer in a time of need without expectation of repayment. To me, gratitude is more than just a "thank you". It is a way of living your life. It is opening your heart and appreciating all that is around you. Gratitude is being thankful for the earthly and spiritual blessings given by God. Gratitude means being blessed by someone's help in your life. Gratitude is being truly and deeply thankful for something, someone, an event, anything that makes a profound difference in your life. You can even be grateful for problems that occur that spurred changes in your life that you wouldn't have made any other way. What a great subject for your hop! Gratitude means living with thankfulness despite our shortcomings or being poor or not able to have what we wish or wanted for. Gratitude is thankfulness and appreciation for all we have. Thank you for such a wonderful blog hop. Gratitude for me is a action word, that you do something to show how grateful you really are. Gratitude to me is being grateful for everything God has done in my life. I do believe you set the bar for blog hops, Daisy! Gratitude for me is letting my wonderful friends know how much I love and appreciate them. I've experienced a couple of tragedies lately, so it's become even more important to me to let friends & family know how I feel about them. And I am truly blessed to have such wonderful friends, most of whom I have met through crafting. Gratitude is being thankful for what you have. Great hop. So many great ideas and so much inspiration! my feelings toward my God for my life - I have all I could ask for and more. Lovely blog hop. I am certain we all have much for which to be grateful, even during these difficult times. I am grateful for the many blessings I have from children to grandchildren and for a roof over my head. I am grateful that each day I can wake up fresh and rejoice in that day. THanks for the blog hop! Gratitude to me is a way of thinking about others, it is a way to extpress generosity in response to that of others also. Gratitude to me means being so thankful for my wonderful friends and family. I can never tell them enough how much they mean to me. Thanks for another great blog hop and the wonderful projects that the DT has created. Gratitude to me means being thankful for which I am blessed.